Decorative stepping stones are a great way to infuse your personality into your garden or landscape. They aren't just for decoration though, stepping stones have a practical purpose too. Decorative stepping stones add another dimension to your garden space. Aside from the obvious aesthetic value however, they also have some important benefits that you're sure to appreciate. Appropriately placed stepping stones are helpful in keeping your feet clean. Space a few inside your garden beds to give you a clean surface for walking as you tend to your plants. This will eliminate the accumulation of dirt on your shoes which always gets tracked across your nicely manicured grass or your living room carpet. Keeping things clean now saves time later. After all, you'd much rather spend your time enjoying your yard than cleaning up the mud you have tracked everywhere. Lawns are also an ideal place to position stepping stones. Look at the high traffic areas in your yard. Is there a track worn where the kids run to their swing set everyday? Has your dog made a permanent trail to his favorite spot under the tree? Here are places just begging to be livened up with decorative stones. Stepping stones are much more attractive than bare dirt. They are also way easier to maintain than it is trying to get grass to grow in a high traffic zone. You have likely invested a great deal of time and money into making your yard beautiful. You may even have a few special focal points, like a water fountain or a statue, in various spots throughout your landscape. How often have you asked a guest to come and see what you have done? Wouldn't you like them to discover these things themselves? The great thing about stepping stones is that people tend to walk on them. For you, this means you don't have to blatantly show off your latest gardening handiwork. The stepping stones will do the work for you by guiding visitors to the areas you want them to see. Just add an occasional bench or resting area and your garden will offer your visitors the same enjoyment that it gives you. Whether you want a lazy, meandering path all around your yard or just want to have a walkway to keep visitors off your lawn, you will need to know how to install stepping stones properly. Done right, your garden stones will last a long time; done wrong, your stones may break or even present a hazard to people walking on them. Don't worry though; correctly adding stepping stones to your landscape is pretty simple. Does your garden have a theme that you would like to follow? Do you want stones that look natural as a part of your landscape? Do you want unique stones that express your personality? Do you want ready-made stones or would you like to make your own? Once you have answered these questions, you can begin shopping for decorative stepping stones that meet your needs. You can choose from natural stones made from limestone, quartzite, slate or flagstone. Or get pre-made stones that are plain or patterned. You can even buy or make molds to create your own decorated stones. There are also kits available for kids to make their own stepping stones that can be personalized with their hand print, mosaic tiles or a number of other colorful materials. This is a great way to make memories that you can relive every time you walk through your yard. 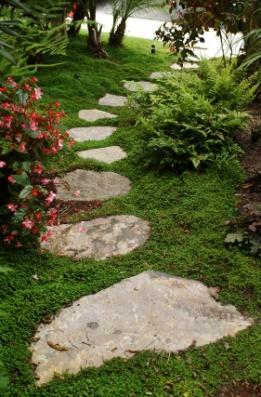 Once you have selected your stepping stones, it is time to place them in your yard. First, plot out the path that your stones will take. You can mark off the area with string on stakes or use landscaping paint to show where you will place each stone.Place your stones along the path at intervals of about 24 inches from the center of one stone to the center of the next. This is the length of an average adult stride, making the stones easier to use. If the area is a place primarily designed for children, you will probably want to place them closer together. Now, dig into the ground about two inches deep (or whatever the thickness of your stone is) and create a hole that your stone will fit snuggly into. Put about a half inch of sand into the hole to help with drainage and help keep your stone level. This will slightly elevate your stone above ground level which will make is easier to keep it from getting covered with dirt. Try not to make it any higher or people will trip over it. Once you have the sand level, you can place the stone in the hole. It the stone is wobbly, just add or take away sand as needed until it is level and steady. Fill in a bit of dirt around the edges, allowing it to slope away from the stone slightly. Once you have installed all your stones, you will wonder why you didn't get some decorative stepping stones sooner!